Several hospitals in Wuhan, capital of central China's Hubei Province, have canceled chest X-ray examinations due to the possibility of physical harm, according to a report from Changjiang Daily on Tuesday. Chest X-rays are a common medical examination method; however they can also damage human bodies due to excessive exposure to radiation. According to chinanews.com, the utilisation rate of chest X-ray examinations is 61.8 percent in China, more than 300 times of that of Britain, which is only 0.2%. Moreover, this examination has already been sharply curtailed in most developed countries including the US and Japan. Liu Junfang, chief of the radiological department of Zhongnan Hospital of the University of Wuhan, said that excessive radiation exposure would harm young children, teenagers, and cause diseases including cancer. Since 2006, the Wuhan Department of Health has canceled X-rays as part of the regular physical examination for students in middle schools and elementary schools. Some hospitals in the city also canceled the examination, or stopped recommending the examination to minors six years ago. Furthermore, experts also suggested that X-ray checks for pregnant women and women with intrauterine devices should also be canceled. 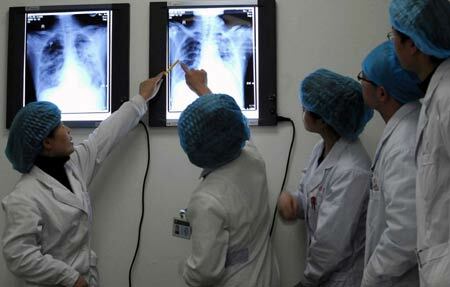 However, Wang Yimin, director of the radiological department of Wuhan PLA 161 Hospital, said the safety level of a chest X-ray examination was still within the national regulations, and some patients choose it due to the low cost.